Gordon's Notes: The Economist's endorsement: What's surprising about it. The Economist's endorsement: What's surprising about it. The Economist has been running a world "electoral college" . Last I looked 80% of their US readers voted for Obama. That's current readers of The Economist, a journal that used to be rationalist 19th century liberal but became a pale imitation of the Wall Street Journal editorial pages in the 90s. Even this readership, the very heart of McCain's former constituency, is massively pro-Obama. So I figured the "paper" would endorse Obama. If 80% of the US readership of a WSJed-lite publication wants Obama, they aren't going to be stupid. Still, in 2000 they endorsed Bush. They never adequately apologized. In 2004, they weakly, half-heartedly, with poisoned pen, "endorsed" John Kerry as "the incoherent". So I was expecting a grudging, muttered, meaningless endorsement. 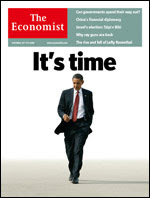 Obama on the cover, striding along. Headline "It's time". "Wholeheartedly". A carefully chosen word. They are not forgiven. They will never be forgiven for their 2000 endorsement of GWB.